Singapore, 19 December, 2018 — ASUS Republic of Gamers (ROG) today announced that the ROG Rapture GT-AX11000 Wi-Fi gaming router is now available. Featuring support for the latest 802.11ax (Wi-Fi 6) standard, which includes a variety of new technologies that improve Wi-Fi speed and increase network capacity and coverage, ROG Rapture GT-AX11000 satisfies gamers’ demands for ultrafast, networking performance and reliability. As a gaming router, it also offers numerous additional features designed to provide the best online gaming experiences, including triple-level gaming acceleration to reduce ping times and provide low latency gameplay, Game Radar to let gamers find the best game server before connecting, Open NAT for simple, three-step port forwarding and dynamic frequency selection (DFS) to avoid interference from other wireless devices. To support the latest Wi-Fi features and keep the network running smoothly even when there are many connected devices, ROG Rapture GT-AX11000 is powered by a 64-bit 1.8GHz quad-core CPU that delivers smooth and responsive performance. A 2.5G Ethernet port gives gamers with 5G LAN on their motherboards or 10G network adapters the ultimate wired networking solution. ROG Rapture GT-AX11000 is the first ROG router with Aura RGB lighting, which can display millions of colors and multiple effects for elevated gaming style. Additionally, a customizable hardware button lets users instantly enable or disable Aura RGB lighting, Game Boost or DFS without using the ASUS Router app or web interface. With the latest 802.11ax (Wi-Fi 6) technology, ROG Rapture GT-AX11000 supports 160MHz bandwidth and 1024-QAM to provide ultrafast Wi-Fi speeds of up to 11000Mbps, 2.3X faster than Wi-Fi 5 (802.11ac) 4×4 tri-band routers. Many Wi-Fi 5 devices, such as smartphones and PCs, already support 160MHz bandwidth, so users can enjoy the faster speeds offered by Wi-Fi 6 instantly with a supported device. In addition to boosting Wi-Fi speeds, the Wi-Fi 6 standard offers increased network capacity and efficiency to address the massive increase in the number of connected devices in recent years. There are often multiple people and other connected devices on a home network simultaneously, which with previous Wi-Fi versions could result in unacceptable slowdowns for users when gaming online. ROG Rapture GT-AX11000 features a revolutionary combination of OFDMA and MU-MIMO technology that provides up to 4X better network efficiency and capacity. OFDMA also enables ROG Rapture GT-AX11000 to provide up to 80% greater coverage1 than previous-generation routers, giving mobile gamers more freedom to game where they like while enjoying smooth performance. Additionally, Target Wait Time (TWT) technology delivers up to 7X better battery life for connected devices1. Wi-Fi 6 is fully backwards compatible with previous Wi-Fi standards, so users can connect any Wi-Fi device to ROG Rapture GT-AX11000 and enjoy a seamless networking experience. Even if users do not yet own any devices compatible with Wi-Fi 6, they can still enjoy improved signal coverage and faster Wi-Fi speeds on their current devices with ROG Rapture GT-AX11000 due to its improved hardware design and use of the latest chipsets and components. ROG Rapture series routers are designed to provide the best networking experiences for gamers, satisfying their needs for low latency and total control of their LAN and WAN connections. Triple-level game acceleration prioritizes gaming packets from the gaming device to the game server. ROG has revamped the first step of triple-level game acceleration on ROG Rapture GT-AX11000 for gamers using ROG notebooks, desktops and motherboards that support GameFirst V. GameFirst V software lets users control gaming prioritization on their device. It now also integrates router controls within the software interface, enabling users to activate Game Boost, the second step of triple-level game acceleration, with just one click. Game Boost prioritizes gaming packets within the local network, ensuring smooth gaming performance even if other network users are streaming video or performing other high-bandwidth activities. In-game testing has shown that enabling both GameFirst V and Game Boost reduces ping times by more than 33% compared to competitor’s solutions. The third step of triple-level gaming acceleration is built-in support for wtfast®, a service that optimizes connections to ensure the shortest path to game servers around the world. With all three steps — GameFirst V, Game Boost and wtfast — of triple-level game acceleration enabled, ROG Rapture GT-AX11000 provides up to 90% lower ping times for dramatically smoother online gaming experiences. Although wtfast provides the shortest path to the current game server, gamers may not know the status of the server before joining and will have to join at least one game to see if the server offers a good connection. Because each match matters, ROG Rapture GT-AX11000 offers Game Radar, which lets gamers check ping times to different servers before playing, so they can choose to join a game with the best connection and gain a competitive edge. Console and PC gamers may sometimes encounter network address translation (NAT) issues that prevent teaming up with other players or being able to host a match. While most routers provide NAT configuration abilities, it is often a complicated process. To make this process easier, ROG Rapture GT-AX11000 offers NAT Open, a new feature that provides NAT configuration in three simple, guided steps. ROG Rapture GT-AX11000 dedicates an entire Wi-Fi band for gaming, preventing competition for network bandwidth with other wireless devices. It also supports dynamic frequency selection (DFS), which unlocks the least congested channels within the 5GHz band, ensuring minimal interference for smooth and fast gaming. ROG Rapture GT-AX11000 is the first ROG router with Aura RGB lighting, which can display millions of colors and multiple effects for a stylish vibe that matches their other Aura-enabled gaming gear. 802.11ax (Wi-Fi 6) is designed to handle dense Wi-Fi environments, so ROG Rapture GT-AX11000 is built with a 64-bit 1.8GHz quad-core CPU that provides processing power to keep even the busiest networks running smoothly. Additionally, a 2.5G Ethernet port provides ultrafast wired connectivity, perfect for 5G motherboards and 10G adapters, and link aggregation enables data transmission speeds of up to 2Gbps, ideal for network attached storage (NAS) devices. A customizable hardware button lets users conveniently enable or disable Aura RGB lighting, Game Boost or DFS without using the ASUS Router app or web interface. ROG Rapture GT-AX11000 comes with lifetime free AiProtection Pro, commercial-grade network security powered by Trend Micro™ that protects all connected devices within the network, even those that cannot run security software, such as IoT devices. AiProtection Pro regularly auto-updates its security signatures from the Trend Micro database to ensure network security is always up to date. Support for ASUS AiMesh allows users to create a mesh Wi-Fi system by connecting other supported ASUS and ROG AiMesh routers to their network, letting them enjoy whole-home coverage with seamless roaming, synchronized features and centralized control. ROG has also partnered with Activision to create the limited-edition ROG Rapture GT-AX11000 Call of Duty®: Black Ops 4 Edition. Featuring futuristic, military-themed design elements for both the hardware and user interface straight out of the latest blockbuster PC game, ROG Rapture GT-AX11000 Call of Duty: Black Ops 4 Edition is the ultimate accessory for Call of Duty fans. 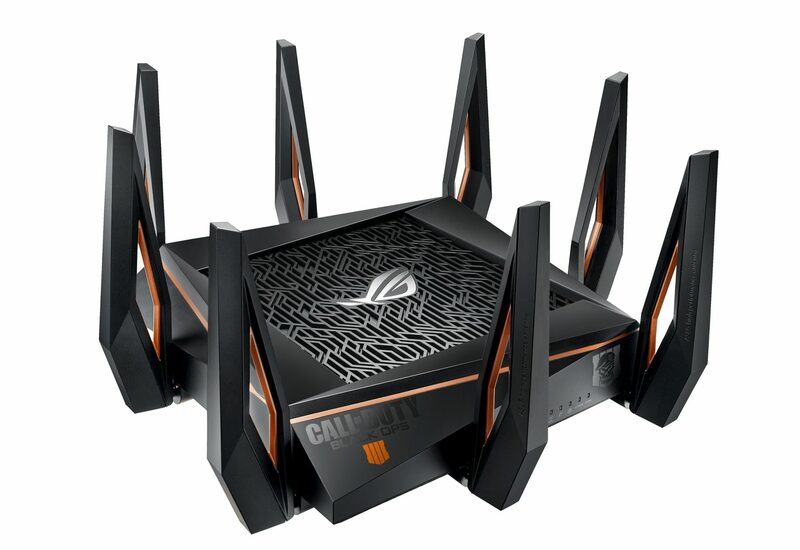 The limited-edition router also comes with a download code for a free copy of Call of Duty: Black Ops 4 for PC, redeemable until April 2019. Note: Regular edition is not available yet. Will be announced at a later date. To benefit from Wi-Fi 6 (802.11ax) features, the Wi-Fi client needs to be Wi-Fi 6 capable.